Just pulled the second monkey off the frame. I was thinking of making Monkey Wrench blocks to go with the name, but ended up making something very similar to the first because it was easier. I did frame the center out a bit more which decreased the size of the top and bottom portions that I needed to make. I haven't got anything that will work for binding, so I'll need to pop out this evening and find something suitable. We have a nice long car trip coming up that will be perfect for binding sewing. I had a training thing after work from 4 to 7. It was rainy and cold and I was SO tempted to curl up in bed with some hot tea and fall asleep watching TV as soon as I got home. Not tempted enough though to forget about Tiny Tuesday though. So first I whipped up blocks number 45 which is called Wheel of Fortune. It has 29 pieces including the little yellow circle in the middle that I still need to sew down. The points turned out so nicely in the center that I almost hate to cover them up, but I'll be good and follow the pattern. 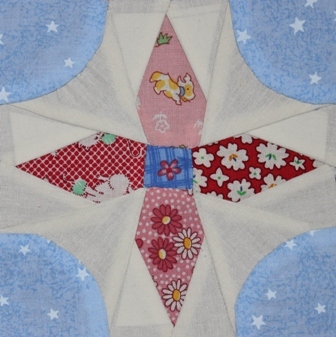 I saw a collection of Midget applique blocks on Sentimental Stitches and I was very tempted to order it. She's been so nice to put up all the patterns for free that it seems like a good idea to support her efforts. I'm afraid I'll go off on a tangent though and fall behind on the pieced blocks. 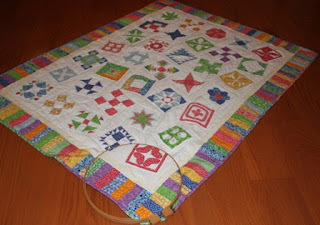 It is so nice to have the handwork to take along on trips, so I might do it anyway. I know, my life is full of complicated decisions. I wanted to get a better photo of Monkey Business. Just one more to go. 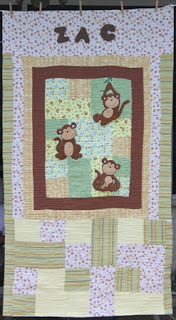 My sister wanted two identical quilts for Zac's bunkbeds, but I'm not sure I have it in my to go into mass production. 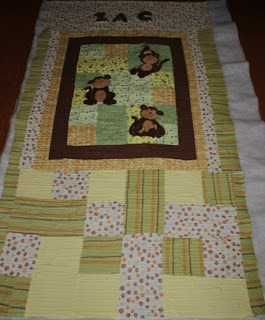 Maybe I can make the next one with the same fabrics, but a slightly different arrangement? Something in me is just calling out for a Monkey Wrench block, though I'm sure I would be the only one to get it. 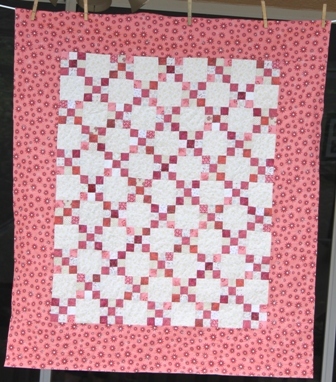 I'm really liking the quilting on this one. They are fairly close maze like channels, and with the polyester batting that I used, they ended up quite firm and puffy. I usually use a cotton blend batting, but tried something different this time. Looks like a busy week around here, but I'll try to stay in touch if I can. OK, so it is way too dark to get a good photo, but I couldn't resist finishing off quilt number three for today. I'll trim this one out and hang it up for a better photo as soon as I'm home in daylight again. Not tomorrow, there is a coaches meeting for Academic team, not Tuesday, I've been signed up for another evening training session. Wednesday? That may be the day. The quilting on this was SO fun to do. The only problem was that I kept outrunning the stitch regulator. I think a nice chocolate brown binding will finish this one off and I can start working on its twin. I think this one will be Monkey Business and the next one will be Monkey in the Middle. I'm trying something a little different for the first monkey quilt. It isn't exactly put together very well. 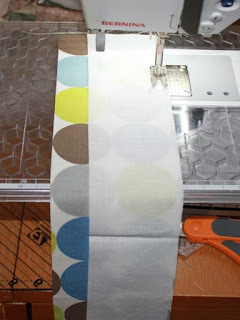 My sister and I were working at Mom's house with a machine that had very little tension, a tiny mat with no ruler and a dull rotary cutter. Considering all of that, I'm amazed that it came together at all. I'm thinking that lots of quilting is the only thing that is going to hold all the pieces together. I'm using these wavy lines that undulate back and forth in a maze like fashion somewhere between a quarter and a half inch apart. I'm sure it won't take me long once I get going, but I really need to get some lesson plans set for the week. 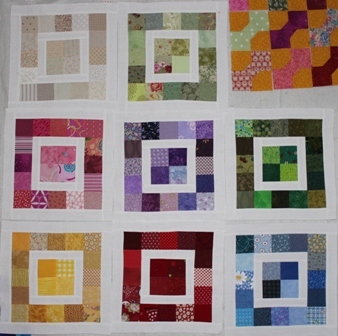 So, just two quilts done today, but the third is soon to come. As soon as a quilt gets loaded on the frame, the urge to start quilting becomes overwhelming. Especially after I figured out that Zack's quilts need to get done. Also, I picked up a spool of baby pink thread while I was out this morning. And how long could this tiny little guy take anyway? The borders got a little loop de loop with flowers while the center got got plain old loop de loops. I kept them small to go with the scale of the blocks. It isn't a big quilt, and it doesn't have a home, but I'm sure someone will have a baby girl eventually. 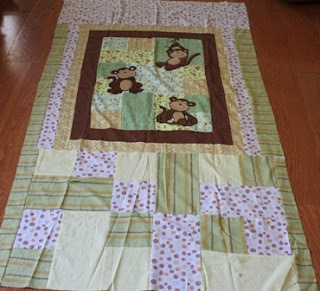 Now the frame is empty again and I can get moving along with the monkey quilts. Two quilts in one day, I'm doing a little happy dance right now. I wasn't in a piecing mood this morning after finishing the Loggies. Instead I pulled out Baby Nines and got it loaded onto the frame. In the process of digging, I unearthed Monkey Business which is for my nephew Zach. It is supposed to be two quilts, my sister and I finished the first while I was staying with Mom after her surgery this summer. 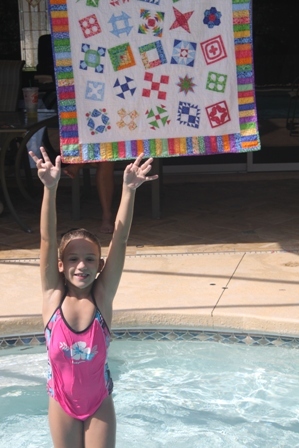 I'll be seeing her again soon, so finishing off those quilts percolated to the top of the list. I didn't have anything for backing or batting of course, so me and my Joann's coupon needed to make a trip out. Foundation piecing paper was on the list as well and the girls want "grass" to put under their doll houses. While I was running out these little cuties were finishing up in the wash. 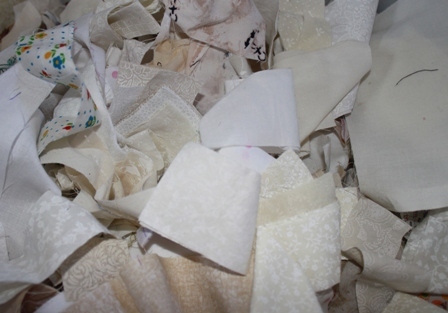 I haven't got a large stash of 1930s fabric and have been trying to get a little collection going for the midget quilt. Mom called me from a quilt shop near where she lives and was telling me about all the great fabrics they had. She isn't a quilter, but was there with my Aunt Marilyn who was visiting from out of town. Marylin is a big hand quilter and is always working on something for her church. I told Mom to ask them if they carried any depression era reproductions, and she picked out a stack of fat quarters to send to me. Aren't they cute? 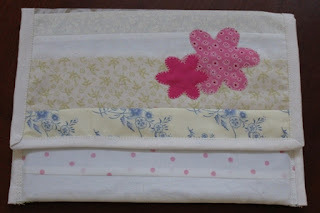 I especially love the floral on the left end, I know just the block that it will go into. 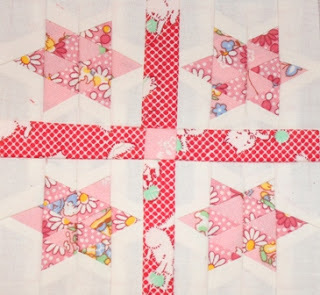 So now that I am stocked up on new fabrics and foundation paper, I am inspired to work on a midget block, but I guess I'd better work on the other quilts first. Finishing one project always gives you license to think about the others. I think maybe I'll try to finish the RRCB blocks this morning. All the pieces are done, it is just a matter of attaching all the triangle parts to the edges of the center parts. 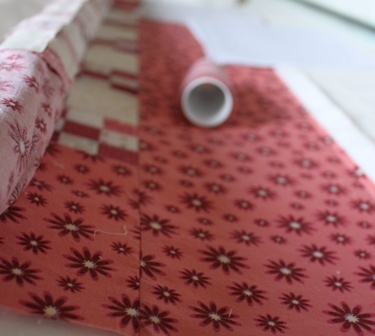 I've got a backlog of binding to hand sew, but I'm saving it for the next long car trip. I think I've also still got the little pink nine patches ready to load onto the frame. So many projects, so few hours on the weekend. Pulled Little Loggies off the the frame just in time for dinner! Maybe later I'll find some binding. I'm sure there is something that will work in the leftover binding drawer. This is the third quilt I've made with these fabrics after all. I think they are gone now though, it almost makes me sad. It is a strange balance between being happy to use things up and sad when they run out. Every time I opened the door or picked up the phone today I wanted to lead with, "Hello, I'll be your cruise director today." Sometimes being a mom is all about keeping up with everyone's schedule. In between playmates and parties and such I did manage to get the Little Lonely Loggies prepped and on the frame. Kurt was off playing beach volleyball, so as soon as he got home I updated him on everyone's coordinates and ETAs and took off with Anna to go bedroom furniture shopping. We had a mother daughter lunch followed by a grand round of all the local furniture stores. I'll take photos when it gets delivered, but she picked out a cute cottage style set in white. I think it will look great with her dark blue walls. 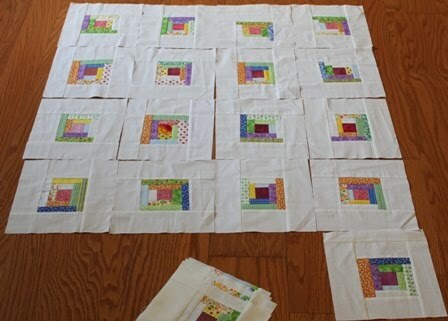 So by three we were home again and I got the first quilting pass underway. I'm doing free handed swirlies and should be done by dinner. If I get back to quilting that is, instead of sitting here in front of the computer. 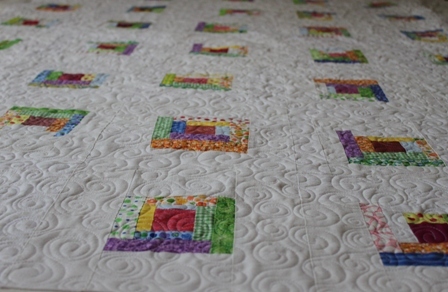 Hopefully everyone is finishing off their white project today for The Rainbow Scrap Challenge. 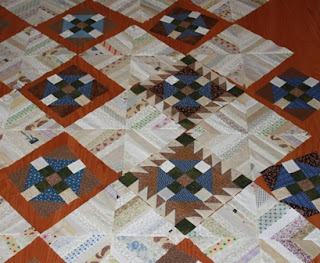 My plan is to get Lonley Loggies loaded onto the frame and get started on the quilting. 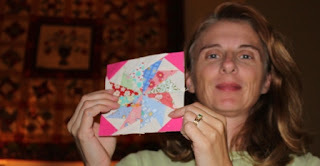 I'm thinking of using the same swirl pattern that was on Starlight. We've been watching the weather all week, but Irene has bypassed us completely and all is calm. The kids were all hoping for a hurricane day. Having survived the year of Charley Frances and Jean, I'm not quite so fond of hurricane days and was just as happy to have it move on by. I stayed at work late last night and got caught up on all of my grading. I've got 6 classes this year and keeping up with everything at the same time has been a tricky proposition. It's been a great year so far though, so I am counting my blessings. Use the linky box below to post your own scrappy Saturday goings on and see what others are up to. This block was a little temperamental. I sewed the pointy straight parts in the middle by machine and left the center open. After pressing the seam allowances down I just reverse appliqued the little dark blue square in the center. I've just never been great with all the angles on inset seams. The light blue corners got hand pieced at the end. 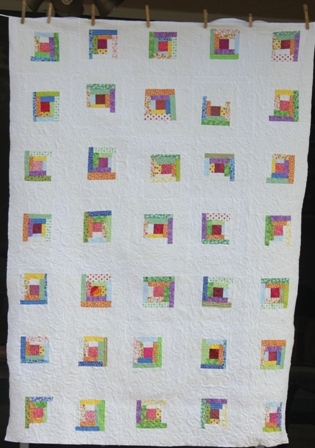 It is Midget Block number 44 with a finished size of 4.5 inches and has 21 pieces. I'm not sure why it is called Sunset Star but I am glad to cross it off the list. 4 years later. Glad to cross this one off the list. 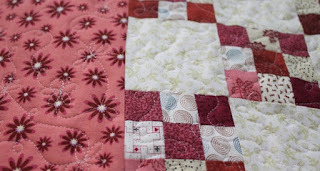 Close up of the border treatment. Just finished the Little Loggie Blocks! I would have been able to get them done last weekend if not for running completely out of white on white fabric. 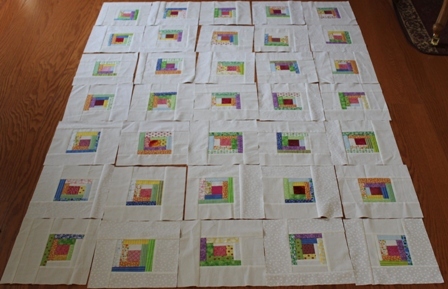 I think I'll get them up off the floor and sewn together while things are quiet. Kurt has taken all the kids to a Cub Scout thing at a local theme park. It is the first time today that there hasn't been a nonstop parade of activity. I think I'm going to lock the door, let the machine get the phone and enjoy the peace. I hope everyone is looking forward to a nice relaxing weekend at home. I know I am. This was our first full five day week at school. Everything is going fabulous so far, but it is still nice to have a respite from all the activity. I added a white Happy Scrappy Block to my collection in honor of August being the white month. My main goal today it to get the Lonely Log blocks together. I am also just INCHES from finishing up the hand quilting on The Elm Creek Sampler, so that will definitely be high on the list. 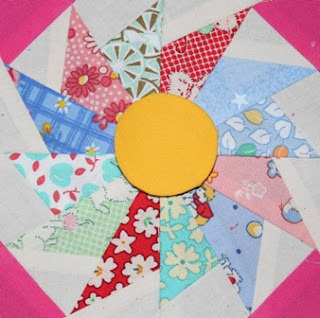 Use the Mister Linky below to share your own progress on this ScrapHappy Day. 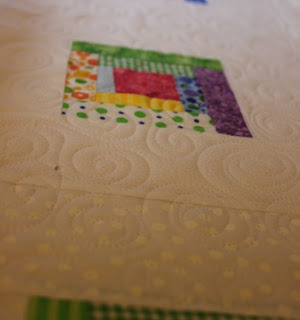 There is a reason I don't do much hand quilting. Although I consider myself to be a patient person, I enjoy seeing results. Is it possible to be TOO goal oriented? 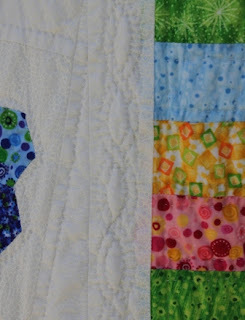 It feels like I've been quilting this same quilt for absolutely YEARS. With only a small section of the border left I am starting to see the beginning of the end. 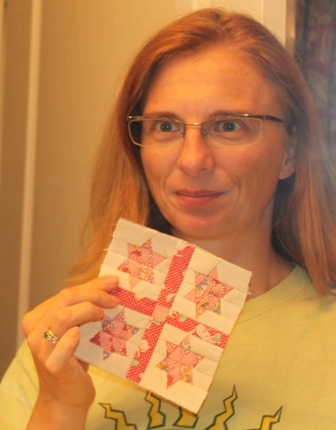 It was a good day at school today so I thought I'd take a few minutes to enjoy a little quilting time before heading off to bed. We are studying the neuron tomorrow and I got a little drowsy previewing an animation of the action potential. Tomorrow is FRIDAY though, and I am sure to find some time this weekend to indulge in something fun. It HAS been years. I checked! 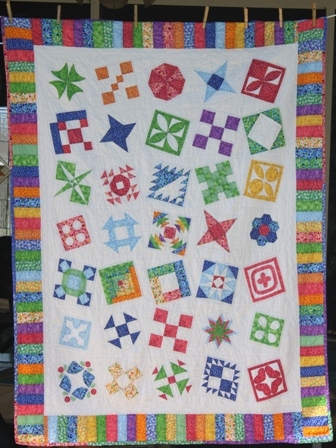 I first posted about this quilt in January of 2008. By then all of the blocks were done. 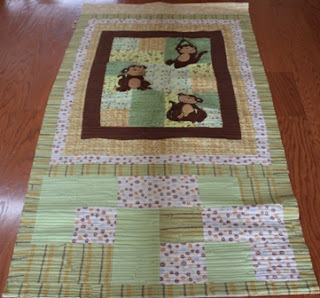 It has taken 3 years and 7 months to quilt this one. I guess that explains why more of my quilts aren't hand quilted. It seems like a while since I finished a midget block, so I thought I'd take a break from school work for the evening and spend some time on the next block. Last night was open house night for parents which made for a very LONG work day, so it was nice to take a break today and spend a little time sewing. 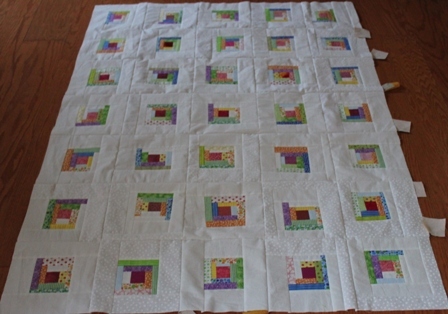 This is midget block number 43 and it has 85 pieces! 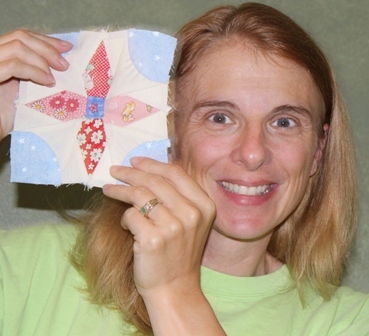 It is paper pieced in lots of tiny sections. It came together nicely enough though, despite lots of running back and forth from the sewing machine to the ironing board to the cutting mat. School started Wednesday, so we've been back for three days already. 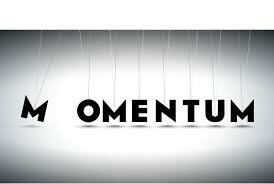 It is great to start on a short week, adjusting and getting back into the swing of things again is hard work. On Thursday we were having safety day. We listen to the Safety Dance song and do safety skits and watch a safety video. Each student got to act out a scenario while another student identified it as safe or unsafe and stated the rule. So after grabbing a pretend hot beaker, the first student exclaimed that he should have worn gloves to avoid burning his hand. The other student thought for a moment before blurting out, "Always use protection when things get hot!". I tried not to laugh, but it didn't work. 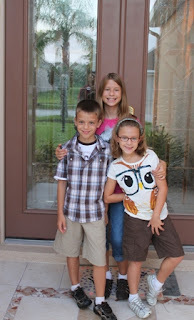 My own kids seem happy with their teachers and are honestly glad to be back at school again. Anna was nervous about rotating from class to class but seemed to handle it without a problem. Ryan has Anna's teacher from last year and I think that will be a good fit. Kurt met Sydney's teacher at registration and thought she would be great with Sydney. I know most of you aren't back to school yet, so keep enjoying your vacation, it will be over before you know it. I can't remember when I started these cute little loggies. Probably last summer. 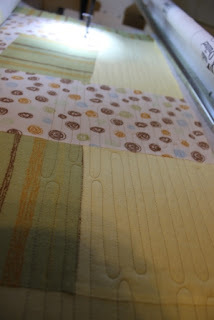 I have three sets of different kinds of blocks that are all sashed out in white of various sorts that I am hoping to make headway on this month for the Rainbow Scrap Challenge. White always seems so fresh and modern to me. 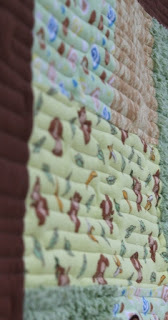 I've made three quilts from this fabric so far, and I love each one more than the last. The Elm Creek Quilt is almost done with laborious hand quilting, and the Welcome Pineapple Quilt was a spring break project from a few years ago. I'm out of the bubble white on white that I was using and haven't got any others to substitute. I've been trying to branch out with background fabrics lately and have stocked up on cream shirting and small scale prints instead of my old favorite WOW. I asked DH to take a look and he thinks that all the white needs to be broken up with a dark border around each block, but I'm leaning towards a more minimal dots of color is a sea of white look. What do you think? Minimal and modern or divided by traditional lattice strips? I noticed that I hadn't posted a thing since the night before the first day of school. I guess that says something about how my year is going. Everything is great, but it is SO busy right now. I've got 6 classes instead of 5 which leaves me feeling a little busy most of the time. It's the weekend though, and I'm ready to rest and recuperate. Somewhere I have some white blocks that just might fit together by the end of the day. What are your plans for scraphappy Saturday? Use the linky to share your progress. Kurt has been looking for a new project. It isn't something I can fathom during the first few weeks of school when I'm only looking for more hours in the day, but he wanted something to do. 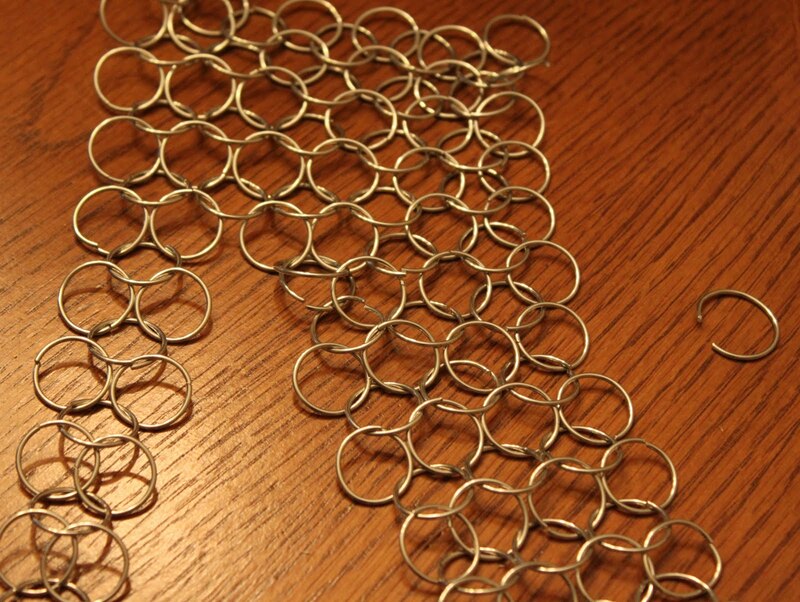 I mentioned that there used to be a chain mail club at school and the physics teacher was getting rid of the stuff. So now the whole family is chaining away. How strange is that? There was a quilt circle meeting last night. I've been trying to get more involved with local quilters for a while now, but the meeting have always conflicted with something. Since I won't be doing much with Girl Scouts this year, it should open up some time in the evenings. Someone demonstrated an easy arrowhead block and they worked on some Santa ornaments that are going to be given away to meals on wheels clients at Christmas. Next time they are doing something mysterious with selvages. Seems like fun. 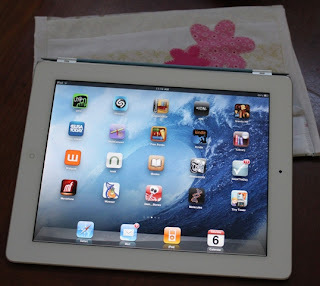 The i-pad 2 has a nifty magnetic cover, but I still thought it would be nice to have a decorative protective sleeve so that it doesn't get scratched up in my purse. I added a couple of little flowers for decoration after seeing the cute sizzix flowers on string blocks over at Quilting by the River. 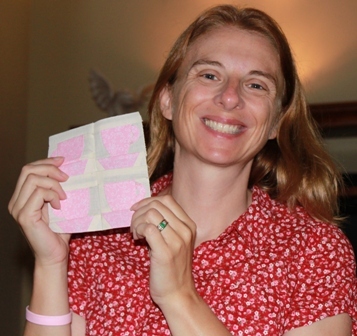 Connie used beautiful batik fabrics, which I loved, but I found something from the scrap bin for mine. 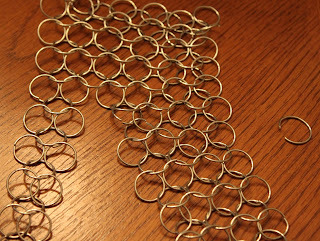 Next time I have a few spare minutes, I might make something similar for my phone. For now, I should get some things done for school. Students come on Wednesday, ready or not. 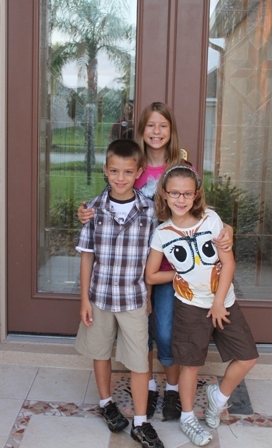 When I talked to my mom last night she told me to make sure I put up some pictures of the kids. So here is a quick shot of Anna surfing this morning. 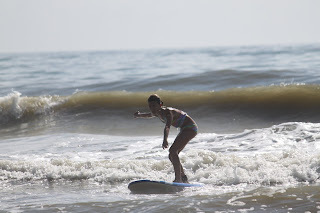 The waves were a little bigger than usual with the remnants of Erin churning out there. Sydney didn't want to surf so she went out to breakfast with me instead. 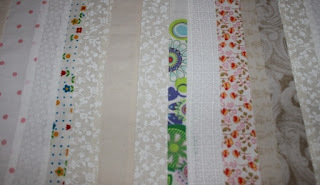 I've been lax lately on getting the Rainbow Scrap Challenge up early on Saturday. This time I'm scheduling it ahead of time so that I don't miss the people in other time zones. I've used the leftover strings from RRCB to make some string fabric. Hopefully this will turn into a nice protective sleeve for my i-pad. Use the linky below to post your own progress with white. 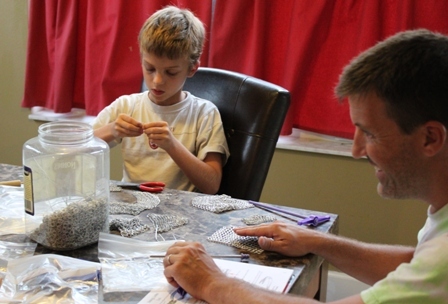 Teachers returned to school on Wednesday and there hasn't been much time for sewing. 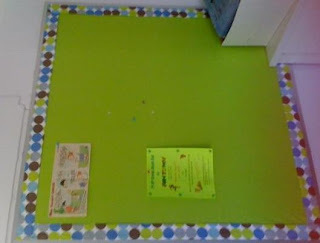 I did manage to whip up a quick border for my bulletin boards though, and thought I'd share a few quick pictures. 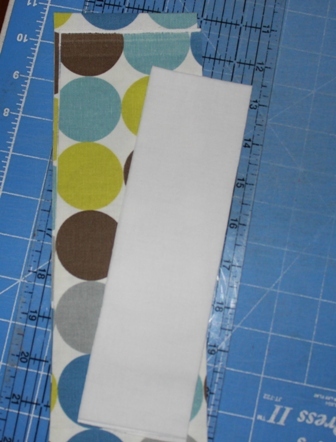 Two strips of fabric, 3.5 and 2.5 inches. 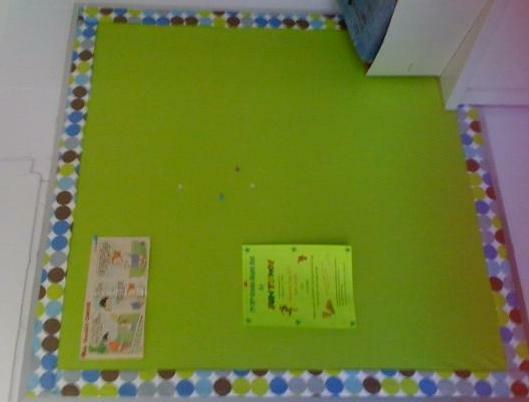 Folded to length and stapled to bulletin board. One year ago today I made my first Midget Block. I think this is my 54th block, It is called Coffee Cups and is number 124. It has 28 pieces. 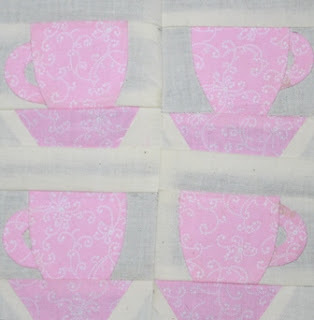 Hopefully after this I will be back to going in order, but I had already appliqued the cup parts down. I'm off to school for the first day of pre-planning. The kids go back next Wednesday. So I'm getting the idea that people don't consider WHITE to be a real color. They aren't quite sure to how to be scraphappy with WHITE. I'm thinking that some people might want to finish up the string blocks from RRCB, while I know others are already starting on Jamestown Landing. I have some random orphan blocks that have been sashed out in white for a modern flair quilt. For people who are opposed to WHITE,then stretch it into tan or beige or cream or peach. Or just mix it with something else that you have in abundance. Blue and WHITE. Red and WHITE. Whatever your heart desires and WHITE. Give it a try, you never know what you might make! 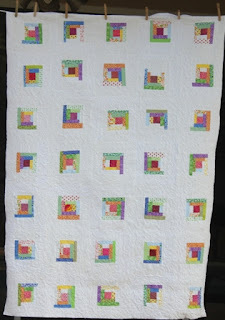 Oh, for those who hadn't guessed, WHITE is the new color for the Rainbow Scrap Challenge in August. Happy scrapping. I spent most of yesterday working steadily on RRCB. I'm going with a slightly different color placement in the main block, I think it ties in nicely with the strings. All the strings are done, and all the center sections on the other block. All that remains are LOTS and LOTS of HST units and cornerstones. They are all in progress somewhere along the way. Instead of chain piecing all of one subunit through, I tend to work in batches. So one batch is partially assembled into rows, one batch is ironed, one is sewn and dog eared while just a few subunits are still hanging out by the machine for their turn. They are sitting in stacks of 10, and every time I sit down to sew something else, I move a stack through. 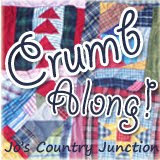 Go over to Judy's to see what everyone else is up to on Design Wall Monday. It is always fun to see what people got done on the weekend.